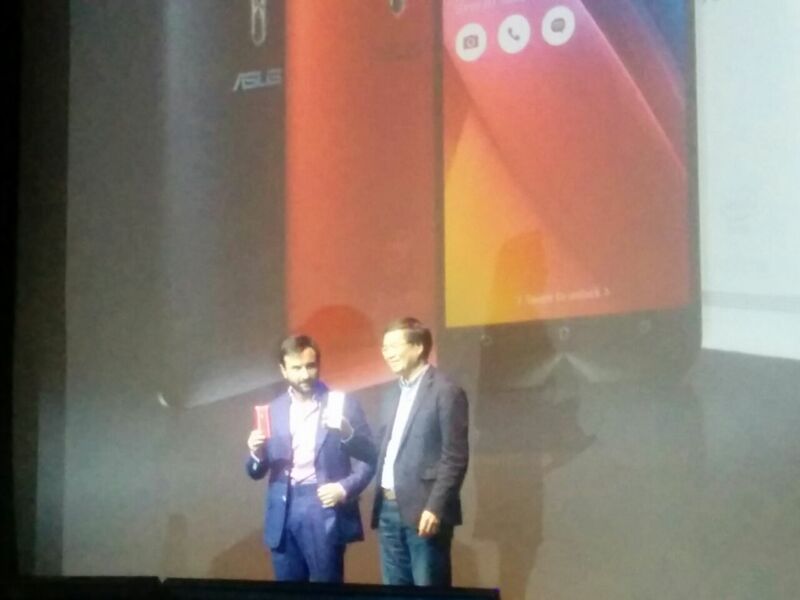 ASUS Unveils Zenfone 2 – World’s First 4GB RAM Smartphone in India! ASUS CEO Jerry Shen today announced ZenFone 2 in India at the Experience 2Morrow press event in Gurgaon. Bollywood star Saif Ali Khan, the renowned photographer Dabboo Ratnani and the celebrated singer Aditi Singh Sharma were also present for the launch. The highly-anticipated ZenFone 2 builds on the enthusiastic reception and success of the first-generation ZenFone in India, and features a stunning new Zen-inspired design, uncompromising performance, and a premium user experience to bring a new level of empowering luxury to consumers. “We are incredibly excited to bring ZenFone 2 to consumers in India,” said Mr. Shen. “ASUS believes that the best technology should be used by a mass audience, and we have drawn on our core competence to deliver beautiful design and unprecedented performance in an empowering luxury for everyone to enjoy. Since its launch last year, ZenFone has been beloved by consumers and has won 238 awards worldwide. Also making an appearance at the event was renowned digital artist and Instagram sensation, Robert Jahns, who spoke about his experience using the ZenFone 2 PixelMaster camera and shared some of the incredible images he captured with it. Mr. Jahns also endorsed See What Others Can’t See, a global photography campaign designed to showcase the advantages of the ZenFone 2 PixelMaster camera technology. Winner of a 2015 iF Design Award, the new ZenFone 2 models feature premium design together with incredible specifications and features at compelling prices. ZenFone 2 has a luxurious metallic hairline finish and is just 3.9mm at its thinnest edges, giving it an incredibly slim profile. With a remarkable 72% screen-to-body ratio, ZenFone 2 packs a gorgeous 5.5-inch screen into a compact body similar in size to most 5-inch smartphones. Designed for comfort and easy one-handed use, ZenFone 2 features an ergonomically curved rear cover with an intuitive button that functions as the volume control as well as the camera shutter button when snapping selfies. ASUS ZenFone 2 comes with the Android 5.0 Lollipop — the latest, 64-bit mobile operating system and ASUS ZenUI 2.0 to deliver the ultimate user experience. ASUS ZenFone 2 comes with 13MP rear-facing and 5MP front-facing PixelMaster cameras for capturing great-looking, high-quality photos and videos in any situation. The latest PixelMaster 2.0 technology features a wide range of enhancements, including Low Light mode on both the rear and front cameras, allowing users to capture up to 400% brighter photos and videos at night or in dimly lit scenes. When a flash is preferred, ZenFone 2 is equipped with a Real Tone Dual LED flash to ensure warm skin tones and natural colors. The camera also features an enhanced HDR mode and a blue glass infrared filter, making ZenFone 2 one of the best smartphones for capturing challenging backlit scenes, such as sunset portraits. The camera’s zero shutter lag lets users take photos instantly, helping them capture those precious moments that can pass in the blink of an eye. ZenFone 2’s 5MP front-facing camera features a wide, 85-degree field of view perfectly engineered for taking selfies. Built-in real-time beautification makes taking selfies even more fun. When taking a selfie with a group of friends, or including scenery in the shot, ZenUI Selfie Panorama mode lets users capture panoramic selfies with up to a 140-degree field of view. ASUS ZenFone 2 is powered by the latest 64-bit Intel Atom Super Quad Core processor and is the world’s first smartphone with 4GB of 64-bit dual-channel RAM—delivering super-fast, PC-like data transfer speeds—for blazingly-fast multitasking and smooth performance when running the latest apps. A 60ms touch response time ensures lag-free input, and OpenGL 3.0 provides incredible gaming performance. ZenFone 2 dual-SIM slot with Dual Sim Dual Active (DSDA) technology ensures that users will never miss important calls. While making or receiving a call on SIM 1, users can switch seamlessly without disconnecting SIM 1 if another caller tries to contact them on SIM 2. Users will spend less time waiting and more time enjoying ZenFone 2 with its high-capacity, 3000mAh battery that provides more than a full day of use on a single charge. BoostMaster technology enables 2X faster charging, letting users charge ZenFone 2 from from 0% to 60% in just 39 minutes. When charging, ZenFone 2 helpfully displays the current battery state and remaining time needed before the battery is fully charged. ASUS ZenUI on ZenFone 2 has been updated to provide a simpler and smarter user experience. To ensure ZenUI is always up-to-date, ASUS put more than 30 ZenUI apps in the Google Play, so each app can be updated separately without having to wait for a system update like on most other Android smartphones. With ZenUI Instant Updates, ASUS developers can make ZenUI updates available immediately, avoiding delays between app releases and ensuring the best experience for ZenFone 2 users. ASUS Launcher, also available in Google Play features enhancements such as easy customization and ZenMotion, a collection of intuitive touch gestures, each providing a new way of interacting with ZenFone 2, such as double tapping on the screen to wake the device. Along with ZenMotion is a collection of touch gestures that can be enabled to instantly launch different apps even when the screen is off. For example, when a user swipes the screen as if writing the letter C, the camera app will open. Swiping as if writing a lowercase letter E will open the email app. Other special motion gestures are available for different purposes. For example, by double-tapping on the home key, the user can switch to one-hand mode for easy single-handed operaton. The user can also gently shake ZenFone 2 to have the information currently displayed on the screen be added to Do It Later. SnapView lets users easily secure their data in ZenFone 2. SnapView provides different storage spaces to keep personal files separate from work files. SnapView ensures photos, documents, and other files remain unopened if a user logs in with different username. ASUS ZenFone 2 is packed with entertainment features. Its 5.5-inch Full HD (1920 x 1080 resolution) IPS display with a wide 178-degree viewing angle and ASUS-exclusive TruVivid technology delivers amazing brightness and brilliant colors for incredible gaming and video-watching experiences. ZenFone 2 is equipped with SonicMaster technology for revolutionary smartphone sound quality. Compared to its predecessor, ZenFone 2 has 38% larger audio chambers and improved speakers with better diafragmas and stronger voice coils, resulting in 4X more powerful sound output, 4X deeper bass (increased by 14dB), and 2X higher pitch. The included Audio Wizard application lets users customize ZenFone 2’s sound for a truly personal audio experience. When AudioWizard is turned on, users can choose from six different output modes to give them the type of sound they desire. For detailed information on model-specific pricing and specifications of Asus Zenfone 2 – Click here. Update: Zenfone 2 Gets Out of Stock During First Pre-order on Flipkart! ASUS ZenFone 2 ZE551ML/ZE550ML Specifications, Accessories & Price In India! Asus Zenfone 3 Laser Review: A Decent Performer! Asus Launches X555 Notebooks That Promises Power Packed Performance!